PULL THE SWORD FROM THE STONE AND BECOME KING! * Three versions of the Arthurian story: Hollywood's knights in shining armor, the gritty hero of Welsh legend, and a historical world stripped of all magic and monsters. 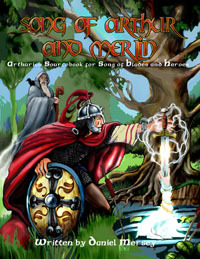 * 100 new rosters including famous knights of legend, magicians and creatures from British folklore, historical Britons and their Saxon, Pictish, and Irish enemies.